Combats are the most complex events in the game, especially when multiple enemies are involved. It would not be fair to let a player handle it by himself when learning the game. Also, someone should look out for the enemy during combat - it is easy for a player to overlook a special ability. 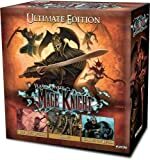 If a combat happens, the player that was playing before the active player (or the player who knows the game best) should become the Combat manager. He makes no decisions for the enemies; it is just his duty to see that everything goes according to the rules. The Combat manager function is handy during your first games, as you get used to the mechanics. Combat managers are also needed in the final phases of advanced scenarios when players will encounter great battles with many enemies at once, and it is not easy to keep track of all the special abilities and bonuses they have. In combat, you mainly use cards and Units that have "Attack X" or "Block X" abilities. If "Attack or Block X" is written on the card, you can use it either as Attack X or as Block X, but not as both. 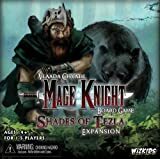 You play these cards the same way as you play Move or Influence cards: you stack multiple cards together to add up their values, you can power them with mana, and you can play non-wound cards sideways as Attack 1 or Block 1, etc. Play cards for each phase of combat in a separate column. There are also some advanced types of Attacks like "Ranged Attack X", "Siege Attack X", "Fire Attack or Block X", "Ice Ranged Attack X", etc. Ranged and Siege Attacks are the only attacks that may be used in the Ranged and Siege Attacks phase. Elemental (Fire and Ice) Attacks are useful if you encounter an enemy resistant to the usual physical Attacks (see later). Until then, treat them as any other Attack. When a card provides "Attack X", it always means regular (non- ranged) physical Attack. A card played sideways to an attack provides Attack 1 (physical, not ranged attack). There are also Ice and Fire Blocks. Until we encounter enemies with elemental attacks, treat them as any other Block. Ranged and Siege Attacks phase - In the fi rst phase of combat, you have a chance to eliminate enemies before they get to you, but only if you have Ranged or Siege Attacks. If you eliminate all enemies in this phase, the combat is over. Block phase - If any enemies survived the first phase, they will now attack you. You will have a chance to block the attack. If you do, it does no harm to you. Assign damage phase - Any enemies that you did not block will now deal damage to you and/or your Units. You can decide how to assign the damage. Attack phase - Now, you can attempt to defeat any remaining enemies with regular Attacks (you can combine them with any Ranged and Siege attacks you didn't use in the first phase). Whether you defeat all the enemies or not, the combat is over after this phase. So, if you can defeat the enemy with ranged attacks, there are no other phases. If not, you either block its attack or suffer damage, and then you have a chance to kill the enemy with any of your remaining attacks. During this phase, only Ranged and Siege Attacks can be played. The following diagram shows three correct ways to generate Ranged Attack 5, along with two illegal combination attempts. In the 1st example, we have combined two Ranged attack effects (from an Action card and from a Unit). In the 2nd example, we use two Units, one of them with Siege Attack. That's right, we can combine Siege and Ranged Attacks. The result is 6, more than we needed. Note: We had to power one of the Units with mana to use its Siege Attack ability. In the 3rd example, we used the strong effect of the Concentration card. Note the card says that it strengthens ANY type of Attack by 2, so it can be used to strengthen our Ranged Attack. The 4th example is not valid since you can't play regular attacks in the Ranged and Siege Attacks phase. 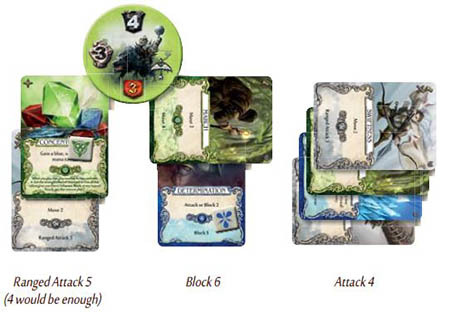 The same applies for the 5th example, as cards played sideways provide regular Attack 1, not Ranged or Siege Attack. If you manage to play Ranged and/or Siege Attacks of value equal to or higher than the Armor of an enemy, it is defeated. Discard the enemy and move your Shield token along the Fame track by as many spaces as the number at bottom of the enemy token. If you crossed the end of the row, you gain a Level at the end of your turn (see the Level Up section later). If you defeat all the enemies you are facing in this phase, the combat is over. If you can't play Ranged and/or Siege Attacks of value equal to or higher than an enemy's Armor, you should not play them at all, as they have no effect. Damage to enemies between phases is not tracked, you either defeat them in one go or nothing happens. However, Ranged and Siege Attacks can be played in the regular Attack phase, where you can combine them with regular Attacks to defeat your enemies. Any enemies you have not defeated in the Ranged and Siege Attacks phase are now attacking you! If you manage to block an attack, it does no damage to you. You can play Blocks (including Fire and Ice Blocks) the same way as any other cards. Note you can also play any non-Wound card sideways as Block 1. If you managed to block all enemy attacks, skip this phase. If not, any attacks that went through will do some damage to your Hero and/or to your Units. An unblocked attack does damage equal to its Attack value. It is up to you how to assign this damage (whether you put some Units in harm's way, or have your Hero take all the damage), but you must assign the entire damage total from unblocked enemies. First, you may choose one of your Units and announce you want to assign damage to it. It does not matter whether the Unit is Ready or spent, but it cannot be already Wounded. If you do so, the Unit gets Wounded - take one Wound card from the Wound pile and put it over the Unit - the Wounded Unit cannot be used again or assigned to take further damage until it is healed (see later). The damage total is then reduced by that Unit's Armor value. If the damage total is reduced to zero or less, the phase is over. If not, we continue to assign the remaining damage. Important: If you assign damage to a Unit, it gets Wounded irrespective of its Armor. The Armor value just tells you how much to reduce the damage total by after assigning the Unit a Wound. If any damage remains, you may assign it to another Unit. If you have no more unwounded Units, or if you do not want to assign damage to them, you must assign the rest of the damage to your Hero. 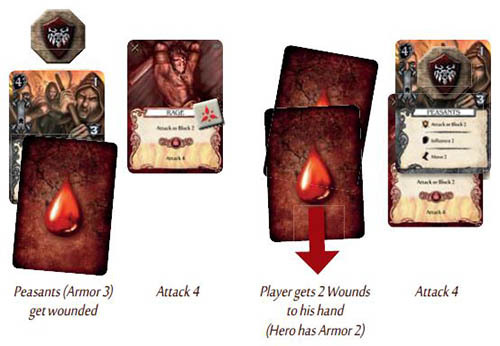 This works the same way as it did with Units, except it can be done repeatedly - you take one Wound card from the Wounds pile to your hand, and the damage is reduced by the Armor value of your Hero (which is 2 at the start of the game - see your current Level token). If this reduces the damage to zero or less, the phase is over. If not, repeat the process (by taking another Wound card and reducing the damage by your Armor again), until all damage has been assigned. See the Healing section later for how to get rid of the Wound cards in your hand. Important: If you assign damage to your Hero, you will take at a Wound irrespective of your Armor. The Armor value shows how much you reduce the damage by after you have taken a Wound. Note: When taking damage to your Hero, you can divide the damage value by your Hero's Armor, and round up to quickly determine how many Wound cards you take. Lets say you are fighting an enemy with attack value 5. You have not blocked the attack, so you have to assign 5 damage to yourself and/or your Units. If you appoint a Unit with Armor 5 to take damage, the Unit gets wounded, and the phase is now over since al the damage was assigned. The same would happen if your Unit had Armor 7 - once you assign damage to a Unit, it gets Wounded no matter how the damage compares to the Unit's Armor. If you appoint a Unit with Armor 4 to take damage, it gets Wounded, and there is still one point of damage left. You can now appoint any other Unit to take the remaining point of damage. It gets Wounded too, and the damage total is reduced to zero by its Armor. If you do not have any undamaged Units (or do not want to Wound them), the damage must be assigned to your Hero. Let's assume he still has an Armor of 2. Take one Wound card to your hand, and the damage is reduced to 3. Take another Wound, and the damage is reduced to 1. Take a third Wound, and the damage is reduced below zero - the phase is over. If your Hero were level 3, his Armor would be 3, so he would only need to take two Wound cards to absorb the damage. And finally,you can assign damage to both a Unit and your Hero. For example, you appoint a Unit with Armor 4 to take damage, and it gets Wounded. 1 point of damage remains, which you assign to your Hero, so you take one Wound to hand and you are done. If there is this icon next to a Unit's Armor, it means it has physical resistance. When you assign damage to such a Unit, the damage is first reduced by the Unit's Armor. If this reduces the damage to zero or below, the Unit is not Wounded. If not, we continue as normal - the Unit gets Wounded, and the damage is reduced once more by its Armor. These Guardian Golems have Armor 3 and physical resistance. If you assign 3 or less physical damage to them, nothing happens, as it wil be absorbed before it does any harm. If you assign 4 or more damage to them, they will get Wounded. If, for example, you have 8 total damage to assign, you could assign 6 to the Guardian Golems, they get Wounded, and then 2 damage would be left over to be assigned elsewhere. Note: Imagine we face an Attack of 5 and the Guardian Golems are the only Unit we have. It would be most advantageous to assign 2 points of damage to our Hero, and let the remaining 3 to be absorbed by the Golem's resistance. This is not possible, though. We have to assign damage to Units first. If we choose our Golems, they absorb al 5 points of damage, and become Wounded. Now, it is time to finish the enemy. You can play any Attacks of total value equal to or greater than the enemy's Armor to defeat it and gain the Fame. Note: In this phase, you can also play Ranged and Siege Attacks and combine them with normal Attacks, and you can also play any non-Wound card sideways as Attack 1. The following abilities do not need to be looked at in detail to continue with the game, but can be referred to when the relevant enemy tokens are revealed. Fortified: only Siege Attacks can be used during the Ranged and Siege Attacks phase against fortified enemies. This is the difference between Siege Attack and Ranged Attacks. Against an enemy that is not fortified, Siege Attacks have the same effect as Ranged Attacks, and they may be mixed together. As you probably have no Siege Attacks early in the game, you won't be able to destroy fortified enemies in the first phase of combat. You have to either block their Attack first or take damage, and then you can kill them in the Attack phase. In the Attack phase, any attack works against them (regular, Siege and Ranged), fortifications have no effect anymore. Physical resistance: these enemies are resistant to physical damage. When attacking them, the total value of your Attacks is halved (round down), except for Fire or Ice attacks. Take a look at these Ironclad Orcs: they have Armor 3, but they have physical resistance. To kill them with physical Attacks, you would need Attack of 6, as the total value of your Attacks is halved. However, an Ice Attack of 3 or Fire Attack of 3 would work, as the resistance applies only to physical Attacks. You can also combine Attacks - for example a Fire Attack of 2 and physical Attack 2 (which may be two cards played sideways), would suffice: The physical Attack is halved, but Fire counts in full. Swift: If an enemy is swift, it is harder to block. To block the attack of a swift enemy, you need to play Blocks equal to twice (or more) its Attack value. This means a swift Attack of 3 can either be blocked by Block 6, or you can let it through and it does 3 damage in the next phase. Brutal: If an enemy is brutal, it is very dangerous. If you fail to block such an attack, it does double damage in the next phase. This means a brutal Attack of 3 can either be blocked by Block 3, or it goes through as 6 points of damage. Poisonous: If an enemy is poisonous, the Wounds taken from it have side effects. When a Unit gets Wounded by such an enemy, two Wound cards are put over it (and it has to be Healed twice to recover - see Healing section later). If a Hero gets Wounded by a poisonous enemy, for each Wound card that goes to his hand, another Wound card is put in his discard pile. These represent the delayed effect of poison - they do nothing now, but they will show themselves in future rounds. Paralyzing: it is extremely dangerous to not block the attack of a paralyzing enemy. A Unit wounded by such an enemy is immediately destroyed (remove from the game). 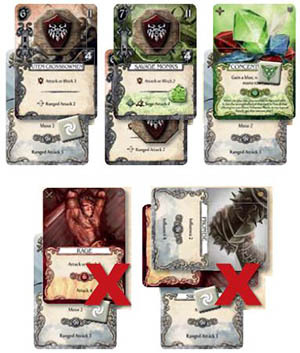 If a Hero takes one or more Wounds, the player immediately discards all non-Wound cards from his hand. That means he will be not able to fight back, unless he has some Ready Units to use. Some enemies have no Attack value - they have the Summon Attack icon instead. These enemies do not attack personally, but they are able to summon a monster to attack you instead. If you destroy one of these enemies during the Ranged and Siege Attack Phase, ignore the icon as the enemy is already defeated. If not, then at the start of the Block phase, the enemy summons a monster - draw a random token from the brown enemy pile to see what is summoned. The summoned monster then replaces the summoning enemy for the Block and Assign damage phase: that means, you either block its attack, or face the damage it deals. Any special abilities of the summoned monster apply. Whether you blocked the monster or took damage, the monster disappears - discard its token and do not score any Fame. In the Attack phase, you will be attacking the original enemy again. When you first reveal an Orc Summoner, you should show a few brown tokens to the players you are teaching. Especially warn them about paralysis, and explain the Knock-out rule (because of Minotaurs), as new players should be aware of the dangers that they may face. If, during one combat, your Hero takes a number of Wounds equal to or greater than his unmodified Hand limit (the number on your Level token), he is immediately knocked out and you discard all non-Wound cards from your hand (like when paralyzed). Keep track of the number of Wound cards your Hero takes during a combat. (There are some cards that harm the Hero who uses them - these count towards a Knock-out too, if used during combat). Wounds already in your hand at the start of the combat do not count towards this total. When explaining this to players, you should show them the Minotaur brown enemy token. Let them work out what it does when unblocked with their starting stats (Armor 2, Hand limit 5). The following diagram shows four ways to deal with a Wolf Riders enemy token. You should be able to understand this example without a detailed explanation. As described earlier, we strongly advise against allowing Player vs. Player combat in your first game. However, if you want to use it, you should read the main principles of the Player vs. Player combat.